Adventure at the Western Funhouse! Is he real or just a rural myth of the American Southwest? Learn everything there is to know about the mysterious and fascinating hybrid creature, the Jackalope! Have fun with vintage Roy Rogers and Dale Evans paper dolls...plus Annie Oakley and other western folks dressed in Cowboy-Cowgirl high fashion! Dishes, knick-knacks, lamps, and other Western-style furnishings and home decor from the 1950s and beyond. Features on classic (and contemporary) western movies and television shows of the 1950s and beyond, such as Shane, Young Guns, Lonesome Dove, The Rifleman, Wanted Dead or Alive, Rawhide...and many more! Explore our photo albums filled with colorful vintage toys made of tin, cast iron and plastic; vintage paint by number images; vintage Western lunchboxes, and much more. Bring back memories of those childhood days gone by. Over 150 movies and their locations throughout the Southwest make up this special section of Taos Unlimited. Complete information about the movies, where they were filmed, and where to buy them! 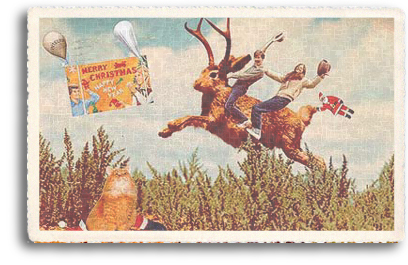 Pictured top right: A vintage postcard featuring the image of the mythical Jackalope with happy riders. 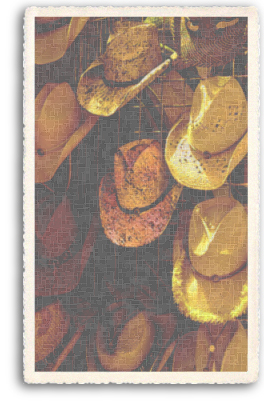 Pictured bottom right: Cowboy hats on sale in Taos, New Mexico.